UC Davis bee breeder-geneticist Kim Fondrk in a Dixon, California, almond orchard. Photo by Kathy Keatley Garvey. 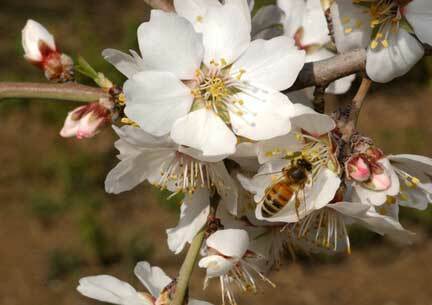 Western honey bee, or European honey bee (Apis mellifera), gathering pollen from almond tree flower. Florida apiary expert, Jerry Hayes, estimates that more than 30% of American honey bees in commercial hives will have died by spring 2010, in the persistent mystery known as “colony collapse disorder.” Photo by Kathy Keatley Garvey. February 18, 2010 Gainesville, Florida - The mysterious disappearance of hundreds of European honey bee colonies in Pennsylvania was first reported in late fall 2006. Since then, the baffling “empty hive” syndrome called Colony Collapse Disorder (CCD) has been reported in many parts of the world. Some beekeepers have lost nearly 100% of their bees. Even though nicotine-based pesticides and lack of plant and pollen diversity are high on the culprits list, there is still no single smoking gun answer. The truth appears to be a combination of assaults on soils, plants and air that weaken and kill pollinators in the 21st Century.